Chegg.com Gives The High Cost of Textbooks The Bird! There’s a revolution taking place on college campuses across the country. Students are tired of paying through the nose for textbooks and this campaign lets students know that they don’t have to buy it,” said Doug Raboy, Creative Director. As 19 million college students across the U.S. return to school burdened by expensive textbook prices and tuition increases, Chegg.com launches a new provocative advertising campaign that gives the high cost of textbooks the bird. This marks the first major broadcast advertising done by a textbook rental company, a key step in the development of the category. Chegg is a superior new service that gives college students the opportunity to rent all their textbooks online and save, on average, more than $500 a year. Since the company started, Chegg has made it possible for hundreds of thousands of students at more than 6,400 colleges save in excess of $84 million. In addition, Chegg supports the environment by planting a tree for every textbook rented through a partnership with American Forests. To date, the company has planted more than 1.5 million trees around the world. 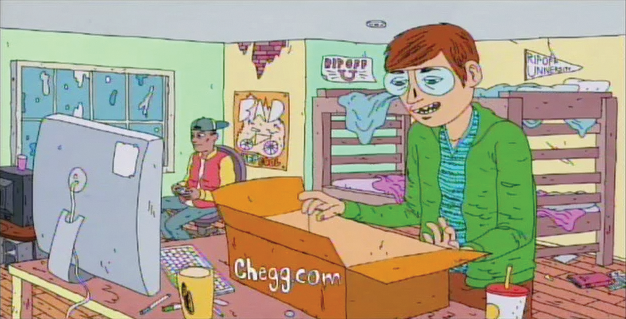 Chegg worked with Buck, who has to its credits Coke, Got Milk? and Toyota, for the animation. Their artists specialize in creating work that is visceral, innovative, and diverse. Chegg.com's transformative concept of money-saving, rental access to textbooks has upended the traditional purchase model, where students had to buy expensive textbooks for only a short duration. Launched nationally in 2007 by Co-Founders Osman Rashid and Aayush Phumbhra, Chegg.com has already made it possible for hundreds of thousands of students at more than 6,400 colleges to save in excess of $84 million. In addition, Chegg.com supports the environment by planting a tree for every textbook rented, bought or sold. To date, the company has planted more than 1.5 million trees around the world.